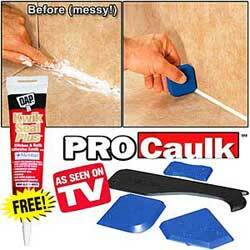 ProCaulk is the hassle-free way to apply and seal silicone with professional results in just seconds. Simply apply silicone as usual, select your sealing edge, then slide along for a perfect finish every time. Use it to seal any edge, any corner or any joint on bathtubs, kitchen counters, sinks and more.